Filipinos love gatherings and good food and summer is one of the best times for reunions, family affairs, vacations and even impromptu parties at home. Usually, it is when there is less planning that an event pushes through. So when you find yourself suddenly hosting a get together with your family or friends for the night, your food panda coupons might just save you a big deal of food expense! Instead of panicking at the idea of not being ready to host a party, just take a deep breath and look at the many options you have versus the time you have on your hands. You have to consider the décor, drinks and menu. Here are a few tips to help you ace an impromptu party and be the best host/hostess for the season. Food is the best concern when having a party. Think of a theme for the party despite being an impromptu one, it could be Chinese, Native Filipino, Italian, Mexican or a simple Cocktail party. If you have time, you can prepare meals that are easy to make. Otherwise you can just call for food delivery at your doorstep without any sweat. You can find online food delivery for a single meal or order ahead of time for a party you are throwing later on. Find a restaurant that serves what you have in your menu and call Food Panda to arrange delivery of foods right at your doorstep. And don’t forget to avail of discounts using your coupons to save money on your party’s food expense. Booze during parties maybe delegated to the boys but you may prepare a signature cocktail for your party. Punch is a staple drink during get-together, so prepare fruits, lots of it before the party and keep them chilled and ready to serve. Put out your punch bowl and make it the center of your banquet to add to the decoration. You may also throw in fruit slices to make it more appetizing. Do avoid plastic cups and go for glasses in different colors or sizes. For your finger foods or Pika-pika, keep things simple for your get-together are more for the stories and catching up rather than food critiquing. Serve some nuts and potato chips in fancy bowls and you’ll be all set. When you decide to order food to be delivered for your party, you will have more time on your hands to handle other details like setting the mood or decorating. Still, don’t sweat the small stuff. All you will need is a few candles and killer playlist to set the mood of your party. 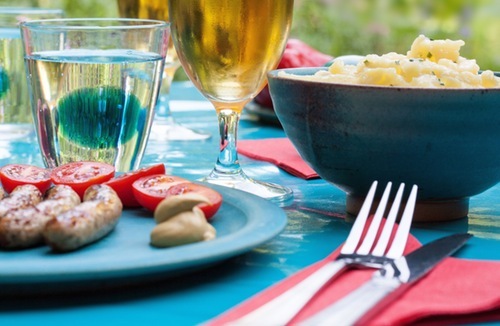 During summer, food can easily spoil so be wary of your menu and make sure you have the party at a well-ventilated area and put fans out to drive away the heat. You may also use light curtains on your windows for that tropical island vibe.